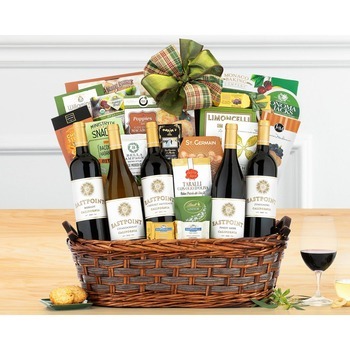 Five wines from Eastpoint Cellars and an abundance of gourmet food overflow this gift basket. 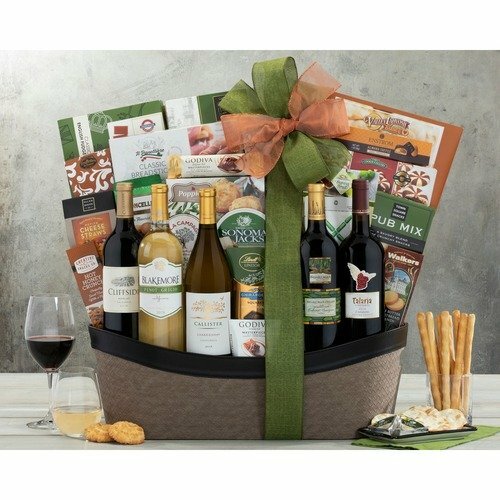 Rich coastal cabernet with rich cherry and currant flavors, creamy chardonnay, slightly spicy zinfandel, smooth merlot and pinot grigio with melon and honey flavors are paired with a large assortment of favorites. Everything from chocolate, truffles and toffee to salami, garlic herb cheese wedges and smoked salmon is included. * I was very impressed with the service and the flowers looked beautiful. Thank you.